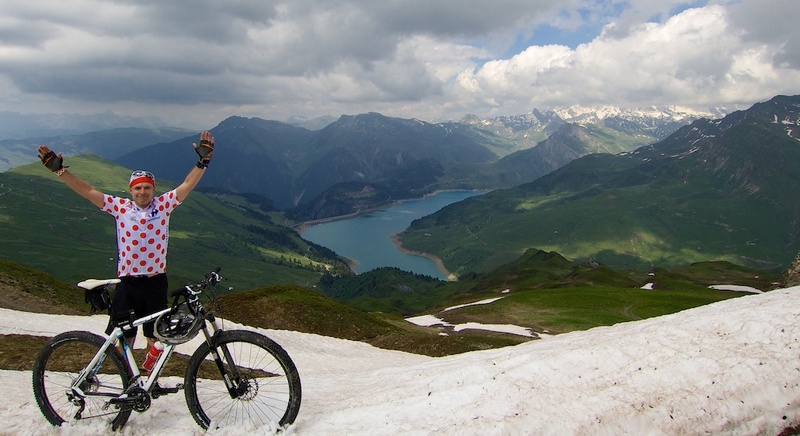 A truly fantastic ride high into the Beaufortain Alps. 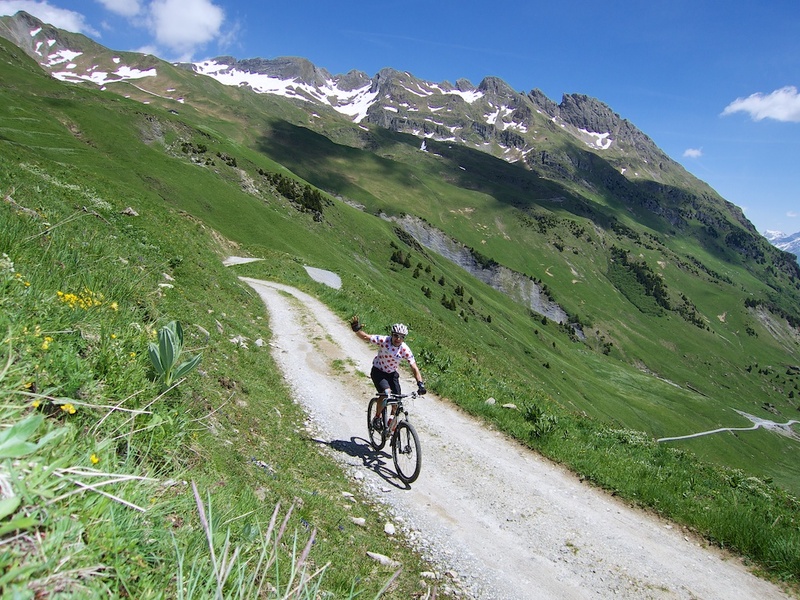 Cormet d’Arèches (2107 metres) is an unpaved mountain pass that links the Tarentaise valley to Beaufort. Most of the route is deserted, and surrounded by high mountains. Fun. 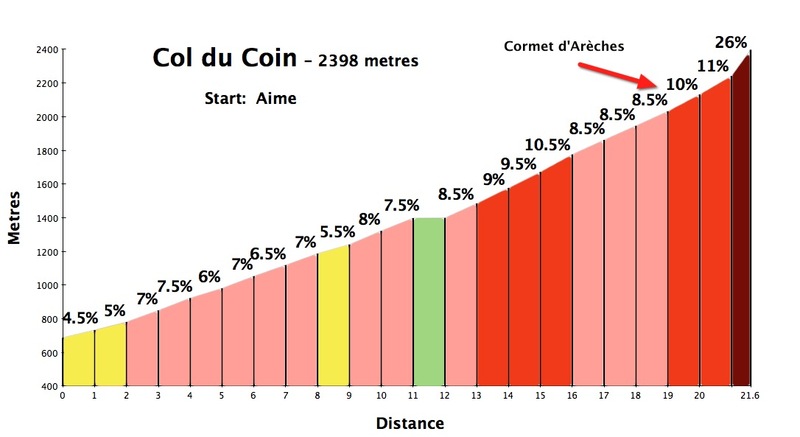 My goal was to climb the south side of Cormet d’Arèches, and then attempt to visit a couple of higher nearby cols on unpaved trails. I started from the Aime train station down low in the Tarentaise valley. 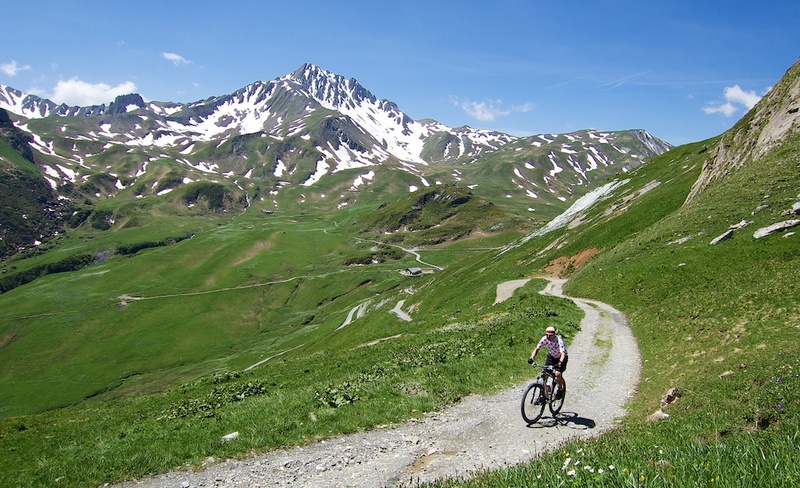 The first several kilometres hairpin up through little villages offering nice views of the valley below and La Plagne ski resort across the valley. Granier is the last village and the route soon turns into a little road heading straight north up through a tight, wooded valley. Cormet is a seldom used word for col or pass. Possibly from the latin “culmen.” I only know of Cormet d’Arèches and the nearby Cormet de Roselend. 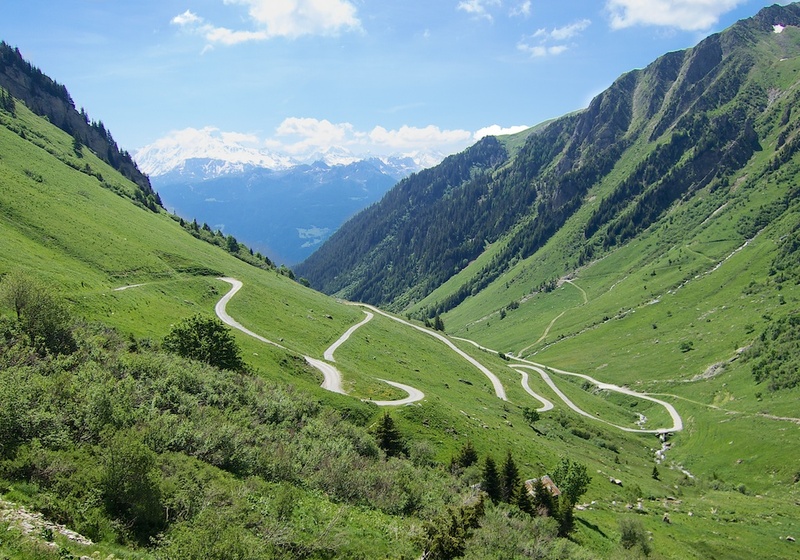 The road lasts for a couple of kilometres then — if you want to get to the col — you need to hike up a very steep trail. Hard work with a bike, but I made it to the Col. 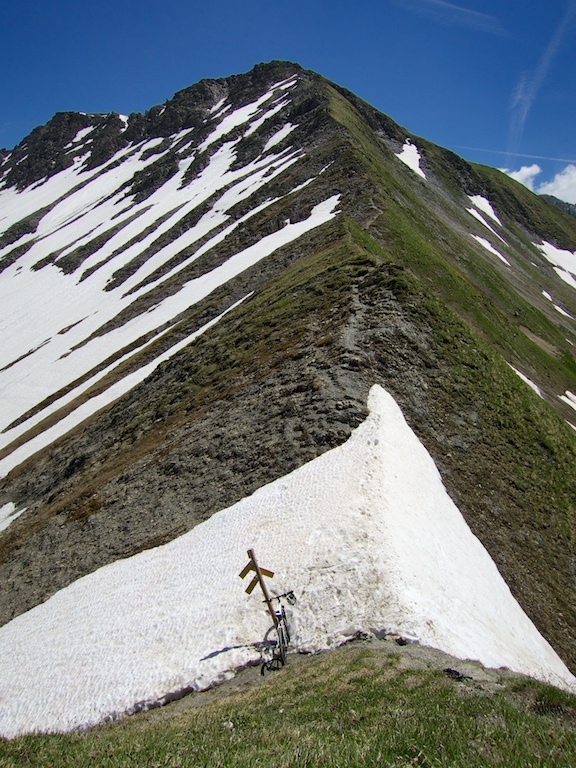 There was a lot of snow at the Col and almost a cliff over the other side. I was too nervous to even photo the front of the sign. I saw a guy hiking down to a snow covered floor, and you could definitely carry a bike carefully down, but there was too much snow for me to feel safe (and I had other plans). I carried my bike back down and explored another couple of roads (see map) before heading back to Cormet d’Arèches. I then descended down the terribly surfaced other side. 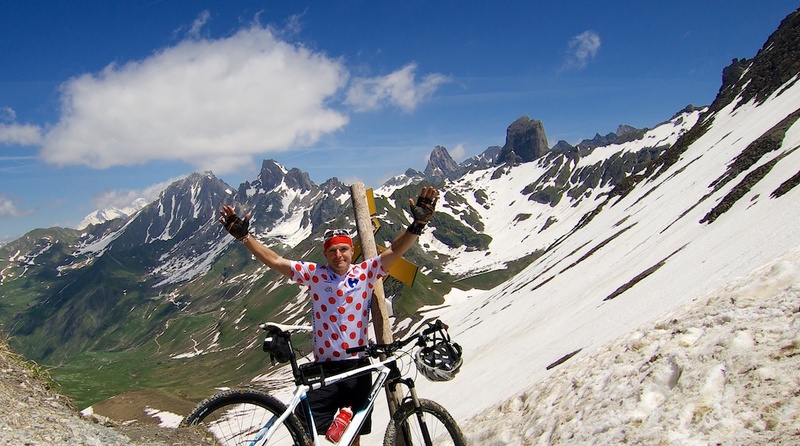 For details of cycling up the north side of Cormet d’Arèches from Beaufort — see here. After roughly 3 kilometres of descent, the road becomes paved again. Here there is also a turn off onto another little path that heads up. I had seen it in the distance, and it looked truly inviting. It was the way to Col du Couvercle. 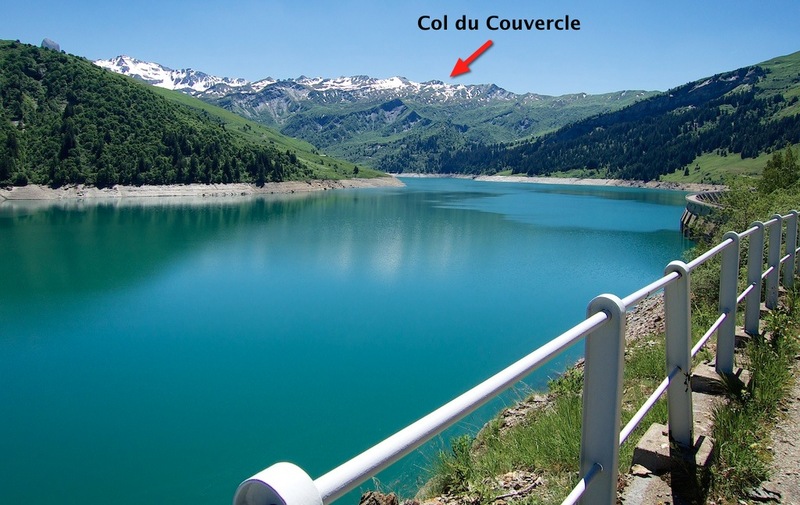 Note: the little dam/lake at left in the above photo is Lac de Saint-Guérin. The way to Couvercle starts off as a decent enough gravel road, leading to a few old cabins, but eventually deteriorates. But it is generally ride-able up. This was such a fun ride. Great views, tough challenges, deserted roads.